If you are looking to buy property in Torrox, Costa del Sol, Spain then you will almost certainly need to find a list of Torrox real estate agents. Examples of properties for sale in Torrox and surrounding area are at the bottom of this page. Torrox is situated off the N-340 coast road and the AP-7 Motorway. The old town of Torrox has a long history but most people will visit the separate coastal area of Torrox Costa and Punta de Torrox which are completely different being modern beach resorts. Torrox is a good place to buy a property whether you want to buy a property for a holiday home or whether you intend to live in Torrox. Estate agents located in Torrox will also be able to help you find property in towns, villages, urbanisations and developments close to the Torrox area. These include: Torrox Costa, Punta de Torrox, Punta Lara Canamiel, Santa Rosa, El Morche, Huit, Lagos, Mezquitilla and Algarrobo. Estate agents in Torrox operate differently as opposed to countries such as the United Kingdom. In the United Kingdom you have to trawl from one estate agent to the next and each has their own unique properties for sale. This is very time consuming. Torrox estate agents and inmobiliaria have their own unique properties for sale but they can also show you other properties on sale from other Torrox estate agents. If you want to know all about what it is like living in Torrox and the current property market, then you must read our in-depth interview with Raquel Jurado of Inmobiliaria Iguatemi on our main Torrox page. Raquel, what would you say would be the advantages to living in Torrox compared to other Costa del Sol towns? 1. Torrox Pueblo is a traditional white-washed village clinging to the hillside in a green valley facing the coast. Even though many foreign people have made Torrox their home, it still holds its authentic Spanish feel. 2. Torrox is known as having El Mejor Clima de Europa (the best climate in Europe) and foreign people living here and other places along the Costa del Sol for years can corroborate this slogan. The weather and climate are perfect, with THE MILDEST summers ON THE COSTA DEL SOL and mild winters. The Tejeda and Almijara mountain range keeps most of the clouds away and even though the winter may be cold compared to the summer, there are many sunny days. Even in the rainy days it doesn’t take long before the sun comes back again. 3. Sunrise and sunset in winter are the most beautiful on the Costa del Sol. Such beauty is subjective but the scale of colors and the fading orange glow over the Mediterranean sea is a magnificent spectacle every day. 4. Local people are approachable and friendly, they receive the new people with a kind smile and they are always ready to help. 5. Quiet village to live all year around, not so crowded as some coastal villages where everyday life is difficult, you only find queues for everything, parking, buying, eating outside…. And it is not far from the busiest places if you want more fun. After some years of recession it seems that the property market has finally bottomed out and falling property prices is a thing of the past. House prices have slightly started increasing, for the first time in six years, an increase along the Mediterranean coast that we have also seen in Torrox area. The friendly real estate agent who speaks English, Deutsch, Nederlands y Español. Great service in both rentals and sales. Avenida del Faro, Bloque 76 bajos, 29793 Torrox-Costa, Malaga, Spain. If you want to buy a property in Torrox – the two estate agents will split the commission so the property you want to buy won’t cost you anything more. Estate agents in Torrox will view a property and give a guideline at which price to market the property however ultimately the owners decide at which price to sell the property for and some unrealistically overprice their houses. Estate agents in Torrox charge different commissions, expect typically to pay between 3% and 5%. If you are looking to sell your property in Torrox then we recommend going for an estate agent with an office in a busy location. A Torrox estate agent with an office demonstrates a degree of credibility and ensures they will have passing traffic. They will naturally also have an Internet presence also. 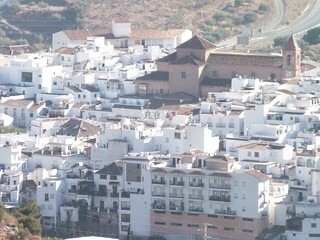 Many estate agents in Torrox will also have houses and apartments for rent in Torrox. Do consider a long term let or rental in Torrox or rent a villa or apartment in Torrox as a way to get to know the area first. Most Torrox estate agents should also be able to help you with these services: finding apartments for sale or rent, villas and houses for sale or rent, townhouses for sale or rent, selling your property, letting your property, information on the local area such as amenities, facilities and schools, new build properties and resales, cheap bargain properties including repossessions and distressed sales, property maintenance, valuations, luxury properties, property finding services and arranging mortgage financing, Some agents will also handle commercial property such as shops to let or lease, bars and restaurants for sale and land for sale. Page Summary – This page contains unique content about estate agents (known in Spain as inmobiliaria) in Torrox as well as a directory of known estate agents in order to help people looking to let or buy property in the Torrox area.